College Grads Grab 90% of Jobs… Calming Pre-Presentation Jitters… Just What Is Business Casual? 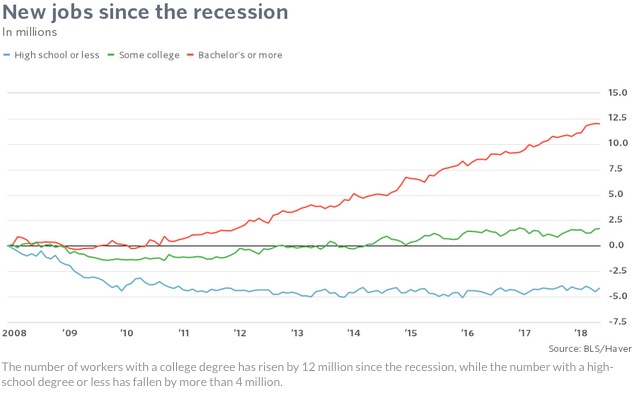 The US economy is depending more and more on an educated workforce, with statistics showing that nine out of ten new jobs over the last year were given to college graduates. American employers have long preferred new-hires to have at least a bachelor’s degree, thereby allotting the highest wages to college-educated employees. However, the divide between those with and without degrees has widened since the Great Recession. Recent data from the Labor Department confirm a pattern that has existed for several decades: rising employment rates for those with a BA or higher; fewer gains for those with at least some college education; and a decline in employment for those with a high school diploma or less. As baby boomers retire in droves, employers are looking to fill those jobs with educated new-hires, people who can demonstrate skills in decision-making, communication, and administration. However, the degree itself loses its impact if the graduates’ skills do not match employers’ expectations of what the degree should bring to the job. Up to 75 percent of people fear public speaking to some degree, and if you’re one of the many, here are some pointers to get through that next speaking engagement. Discuss your fear. Avoid obsessively thinking about the fear by talking about it to a trusted advisor or friend who can remind you that nerves are normal. Pamper yourself. Prepare for the presentation by eating well, exercising, and getting a good night’s sleep before the big day. Understand nervous feelings. Physical signs of nerves such as sweaty palms or butterflies are your body’s way of reacting to an extra jolt of adrenaline that a case of nerves brings on. Some people find that this added burst of energy helps them focus and deliver a better presentation. Prepare. Practice, practice, practice…but not so much that you sound canned. Knowing your material is the best preparation to help yourself through the anxiety. Be on time. Arrive early so you can acclimate to the room where you’ll deliver your talk. Evaluate yourself with kindness. As long as the speech you give is better than the last one, you’ve improved. Learn from mistakes and move on. Enjoy your success. Once it’s over, remember the great feeling of a job well done and recall it the next time you deliver a presentation. For many, the poorly understood dress code label business casualis confusing, and with good reason—it turns out there’s no single definition. Instead, business casual is dependent on where an organization is situated and the industry it is in. Interviewing at a nonprofit or a start-up? Business casual skews to the informal. Starting a new job in DC or on Wall Street? Up your game. Denim is off-limits except maybeon Fridays. Some basics apply to most, if not all, workplaces. No-nos include jingly jewelry, flip-flops, or clompy shoes. But beyond that, experts suggest researching a company’s culture before laying out cash for an outfit that may work for some organizations but cause you to strike out at others. The best advice is to know who you’re dressing for. A new-hire in the farming community would look out of place in a suit, while jeans and a polo shirt would be poor choices in the medical or legal professions. Understanding what to wear at work demonstrates the ability to read and fit in with an organization’s culture, a key marker of a desirable hire. This entry was posted in 1. The Scoop on January 15, 2019 by bizcombuzz.